The Mariners continued with their lack of offensive punch against a powerful Tigers team. The power the Tigers have isn't strictly on the offensive side, but the pitching as well. The Mariners had to face Doug Fister, Max Scherzer and Justin Verlander in this three game set, with the Mariners throwing Aaron Harang, Felix Hernandez and Hisashi Iwakuma at the Tigers. The results of the three games were not particularly good. As a matter of fact, it was a pretty poor showing by the offense, but they can be forgiven considering the pitchers they were facing. The Mariners dropped the first two games, 6-2 and 2-1 in 14 innings. They won the Verlander game by a score of 2-0. I'll assume everybody reading this has some knowledge of rudimentary math and can figure out that the Mariners scored 5 runs in those three games. They can be forgiven this series, but it's April 18th and the hitters need to start figuring out that the big piece of wood they carry to the plate is used to hit the white, round, spherical object being hurled at them. Now, we take a little closer look at the series and their results. Rather than start with the first game and delve into Harang's "pitching" and Mariner offense, I'm going to start with the second game. The game lasted 14 innings and, when getting into the later innings, there was talk on twitter about the all time record for combined strikeouts in a game. With Felix and Scherzer getting the start with their respective teams, a decent amount of strikeouts was to be expected. Felix did his part with 12 in 8 innings and Scherzer brought another 12 in his 8 innings of work. At the end of the game, there were a total of 40 strikeouts for both teams. Let's put that into perspective by looking at a couple of numbers. The Mariners and Tigers played a full 14 innings with 6 outs in each inning. There was a total of 84 outs made throughout the game. Nearly half (48%) of those outs were made by a pitcher punching a hitter out. The starters themselves had a combined 24 punch outs in 16 innings, right at 50%. The Tigers struck out 21 times with Fielder being the biggest goat with 5 K's in 6 at bats. The worst offender on the Mariners' side was Guti with 4 punch outs in 6 at bats. I thought about changing the channel or banging my head against the wall until I fell unconscious, but I couldn't pull myself away. The analogy that came to mind was that it was like driving by a car accident. You know you should keep your eyes on the road, keep going the speed limit and continue on your way, but something keeps your eyes glued to the chaos. Every fiber of your being is screaming at you to just stop looking, but it's all but impossible. That was this game in a nutshell. When Beavan came in to pitch, it was like looking at the accident and then running into a telephone pole to make you realize that maybe it wasn't such a good idea to keep looking. In fairness to Beavan, he's a pitcher who relies heavily on contact, not strikeouts, and he came in to the game with runners on first and second with nobody out. Maybe Wedge thought he could pad his K/9 numbers with the way it was going. Actually, he was probably hoping for a double play, but with the way Beavan has been pitching as of late, I have to wonder if Wedge is even paying attention any more. With the back end of the rotation struggling, the Mariners acquired Aaron Harang from the Rockies for a right handed reliever I've never heard of to plug into the rotation and bump Blake Beavan to the bullpen. Ironically, the Rockies signed Garland a day or two after he opted out of his contract with the Mariners and has been a solid pitcher for the Rockies so far. Harang did about what you'd expect from a 34 year old veteran on the back side of his career. He went an okay 5 innings, giving up 3 runs (3 earned) while walking nobody and striking out 6. The strikeouts were a little bit of a surprise, but since Harang's K/9 during his career has been less than stellar, expecting that to continue is just setting yourself up for disappointment. Then again, being a Mariner fan sets you up for disappointment, so yeah. Beavan came out of the 'pen after Furbush put in an uneventful 1 1/3 innings of work and promptly Beavan'd. He did manage to strike out the one hitter he got out, but gave up a couple of hits and a run in his 1/3 of an inning of work. Bobby LaFromboise relieved Beavan and went an inning, giving up a couple of hits, a couple of earned runs, a couple of walks but struck out three. The first run was LaFromboise's fault when he walked Austin Jackson with the bases loaded. He was lifted for Yoervis Medina who immediately threw 6 straight balls to walk Torii Hunter for run number two of the inning. He came back from a 2-0 count on Cabrera to strike him out looking, so whoopee for him. While I'm sure the coaching staff would rather have given Medina a soft landing, they put him on the mound with the bases loaded and two outs. Medina isn't really known for his control in the first place, so escaping after only the one run was a nice surprise. In the last game of the series, Hisashi Iwakuma's Battle of the Blister reared its ugly head yet again. He did manage to make it 6 innings, allowing 3 hits, a walk and striking out 2, but was pulled after only 70 pitches. Iwakuma is definitely a nice #2 pitcher behind Felix, but one of his best weapons is his split-finger and if the blister problem persists, his effectiveness will suffer. Not only that, but if he's only going to be limited to 6 innings every time out because a blister or something keeps popping up, it's going to be a long 2 years. Hopefully the training staff can get the issue resolved soon without a DL stint because the frustration level would climb a couple of notches not only for the fans, but probably for the players and coaches as well. 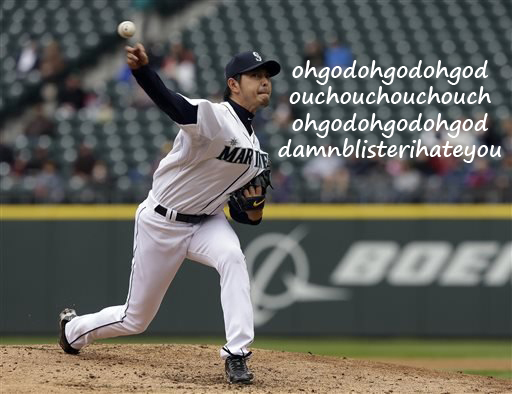 Iwakuma was effective, but this blister thing is something to look out for throughout the season. Because Iwakuma came out of the game after 6 innings, the bullpen had to pick up the last three innings after being worked the night before with a 14 inning game. Carter Capps made it through 2 effective innings of relief, giving up a couple of hits and a walk while striking out 3. Because I wasn't able to watch this game, I don't know if he was more in control of his pitches, but he managed to get the job done regardless, so there's not much point in finding out......yet. Tom Wilhelmsen came on to close it in the top of the 9th after the Mariners managed to actually score 2 runs off of Verlander in the bottom of the 7th. To be brutally honest, I expected a score similar to 2-0 for the end of this game, but I was expecting it to be the other way around, but hey, I'm not complaining. Wilhelmsen took 14 pitches to close out the game after going 2 innings the night before and throwing 20 pitches. A closer throwing 3 innings in back to back nights is not something you see every day and makes you appreciate him even more. That and his X-rated curveball he brings with him. Seriously, every time he pitches, there should be a warning that pops up on the screen telling children to leave the room because of the chance for highly suggestive pitches that make all human's knees buckle. I realize I didn't write much about the offense, but there wasn't much to write about. I'm also guilty of pessimism, even this early in the season, but I'm trying to stay away from it for the sake of my own sanity. Talking about how good or bad a hitter's stats are this early in the season can only lead to trouble later on and we've all had to watch some miserable offensive teams. Let's step back a little, take a deep breath and wait to fly off the handle if it's still looking hopeless in a couple of weeks or so. Next up is a 3 game set in Texas with the Rangers, followed by a 3 game series at Houston. The Texas series starts Friday at 5pm Pacific with Joe Saunders going up against Yu Darvish. To end on a high note, LaFromboise was sent down to the minors and Hector Noesi recalled from Triple-A. Not entirely unexpected with the relievers having been worked hard the last several days and not a lot of options on the 40 man roster. We may get to see Noesi pitch in Texas! Marijuana is legal in Washington state! These two things are related!